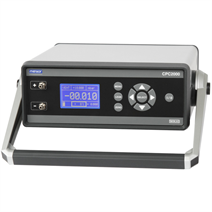 The main applications for this instrument are in the areas of heating, ventilation, air conditioning, filtration, clean room, and medical technology as a calibrator or as highly-accurate measurement equipment and/or precise pressure transducer. The model CPC2000 low-pressure controller is a mains or battery-operated pressure controller with internal, automatic pressure generation and pressure reference. The pressure generation is achieved using an integrated, electric pump, which makes a positive and/or negative pressure available on both the tube connections. As soon as the instrument is switched on, a zero-point adjustment is automatically carried out, so that a zero-point drift is eliminated. The subsequent preparation of a calibration requires only a few settings. First, using the MENU button, select one of the stored pressure units and the variable pressure change step in the range of 0 ... 50 %. Then, once the full scale has been entered in Control Mode, the pressure can be easily increased or decreased by the defined level using the navigation buttons. To check whether the calibration assembly or the test item has a leak, the LEAK button can be used. With this, the pressure is locked into the test assembly and any pressure drop there might be, as well as the the time this takes, is measured and displayed. The instrument has an RS-232 and USB interface, enabling communication and data exchange with a PC. The accuracy of the instrument is certified by a factory calibration certificate. On request, we can provide a DKD/DAkkS calibration certificate for this instrument. Who is Mensor and what do they do?